There’s a war raging out there and it has nothing to do with politics or religion and everything to do with a certain meaty, savory, umami bomb from the northern reaches of Italy, Bolognese meat sauce. The battle lines have been drawn over what exactly makes a Bolognese sauce a Bolognese sauce and what, to varying degrees of horror, does not. One faction is all about the meats, whether veal is needed, what is the right ratio of moo to oink, etc. Another faction insists that only a little tomato paste is permissible, any more and your sauce is just some two-bit, tarted up marinara. Others charge that there must be whole, and only whole, milk added in order to bring everything together at the end. You get it though, everyone and their “Italian” grandma from Norway has opinion on how it must be, instead of embracing all the ways it can be. At the end of the day a good Bolognese meat sauce should be just that, meaty! 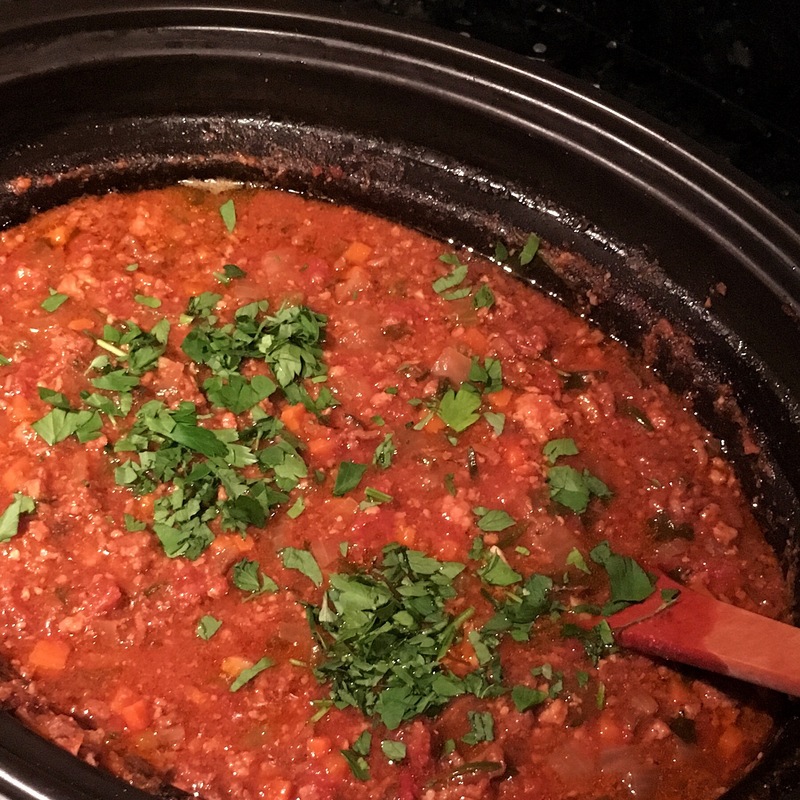 Bolognese is one of the few times when I do not substitute ground turkey or chicken for ground beef in my recipes, it just doesn’t hold up as well and certainly doesn’t replace the depth of flavor that beef provides. Ground poultry also doesn’t get that tiny crumble we know and love from coney sauce or a bean-free chili, those mini nuggets of beef suspended in sauce that is so warm and comforting. One other must of a good Bolognese meat sauce is that it really does need to be simmered for an extended period of time. And as with most slow cook recipes, this one makes a lot, which I think is part of the bargain for being so easy and hands-off. Once finished, I immediately put half in the fridge to cool (to be transferred to the freezer for another day), and then serve the hot half tossed with a pound of pasta. Feel free to cut this recipe in half, but it really does freeze wonderfully, so if the budget allows, go for it and save yourself the trouble later. I recommend using those screw-top pint containers for smaller portions that can be unfrozen in the fridge overnight for a speedy dinner the next night or quart-size zip-top bags that can be frozen flat for easier storage. As I mentioned above, I don’t recommend using ground turkey or chicken, but if you wanted to avoid pork, I would use two types of ground beef, a lean pound and a fattier pound, such as one of round and one of sirloin to get the right ratio of protein to fat. I think you can have the most fun once the sauce is done though…serve it on hotdogs, in lasagna, pizza bread…have fun, play around and most importantly, enjoy! Take the meat out of the fridge about 30 minutes early to let it come to room temperature, this will help it mix in with the sauce better. Prep your onions, carrots, celery and garlic. Set aside. Empty the contents of the two cans of tomatoes into your slow cooker. Using your clean hands, gently squish up the tomatoes so that they release their juices and mash into small pieces. Add in the beef stock, vinegar, onions, carrots, celery, garlic, red pepper flakes, salt, 1 cup of the parsley and the ground pork. Combine well. Next, crumble in the ground beef with your hands, then gently stir it into the sauce. Do not over mix as you can make the beef tough. Finally, press the whole fresh rosemary sprigs and bay leaves down into the sauce. Cover the slow cooker and cook on high for 4-ish hours or low for 8-ish hours. The low setting is pretty forgiving, so if your schedule demands it cook longer, it will be fine. About 30 minutes before serving, remove the cover and mix well, making sure to break up any clumps of meat that might exist. You want the meat to be finely crumbled at this point. Continue to cook on low, uncovered, for the final 30 minutes, stirring every 5-10 minutes. Just before combining with the pasta, stir in 3/4 cup of the remaining chopped parsley, saving the final 1/4 cup to garnish each serving. Around the time you remove the cover to the slow cooker, I would get water going for your pasta. Cook the pasta according to package directions. Serve topped with remaining parsley and grated Parmesan cheese and nosh!